The OBD reader does not need to be manually turned on / off as it is powered by the vehicle. The speaker is packaged with a full charge but is placed into shipping mode to preserve the battery. 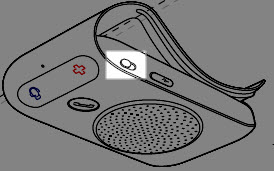 Slide the Hands-free Calling On / Off Switch (graphic shows speaker in the on position) on the side of the speaker to power it on or off. If charged, the speaker still functions for Customer Service and Emergency Assistance calls while toggled off.